Since releasing Orchid Album on the iOS App Store last year, I’ve had requests for a Windows PC version. Over the past few years I’ve been working on some other PC apps, but didn’t have the time to work on a PC version of Orchid Album. With the recent release of Bonsai Album for PC and Story Tracker for PC, I’ve finally had a chance to ponder the possibility. Today I’m pleased to announce my plans to bring Orchid Album to Windows PCs! Windows versions from XP SP3 through to Windows 8.1 will be supported. I also plan to make any necessary modifications for Windows 10 support, once that’s released. The app will contain many of the features of the iOS version, with the addition of some new features like enhanced search and printing capabilities. You’ll be able to transfer your database to and from the iOS version via WiFi, too. I’m currently hard at work localizing the iOS version into French, Italian, German, Spanish, and Portuguese for the version 1.3 update. These languages will also be supported in the PC version. If you’re interested in learning more about Orchid Album for PC as development progresses, visit the Orchid Album Facebook page or sign up below to be notified via email closer to app launch. UPDATE: Orchid Album for PC is now available! The following should address any questions or concerns you may have about Story Tracker for PC. I’ll be updating this post as new questions arise. Let me know if I’ve missed anything! 1. When will Story Tracker be available for PCs? Story Tracker for PC is now available for download from my website here. You can learn more about Story Tracker for PC here. 2. What operating system do I need to be able to run Story Tracker for PC? The app works on Windows XP SP3 / Vista / 7 / 8 / 8.1. It requires the .NET Framework 4, which will be installed automatically if your computer does not already have it. It also requires the .NET KB2468871 update patch. 3. I already have Story Tracker on my iPhone, iPad, or iPod touch. Do I have to buy it again for the PC? Yes, if you would like to run Story Tracker on your PC, you’ll need to purchase it direct from my site. The PC version includes some additional features over and above the iOS version, including enhanced search and printing capabilities. I first began work on Story Tracker for PC in 2013. The app had to be substantially re-designed and completely re-written for the PC platform. Unfortunately porting the app to the PC wasn’t as simple as you might think! 4. I’m not sure if Story Tracker for PC will suit my needs. Is there a free trial version available? Yes, it’s available for download from my website here. The app is initially in an unregistered trial mode, limited to 5 stories, 5 markets, and 5 submissions. It will also only allow a single database window, and database import is disabled. That should be enough to give you some idea of whether the app will work for you. Purchasing a license either within the app or via my website unlocks full functionality. 5. I have a Story Tracker database on my iPhone, iPad, or iPod touch. How do I transfer it to Story Tracker for PC? 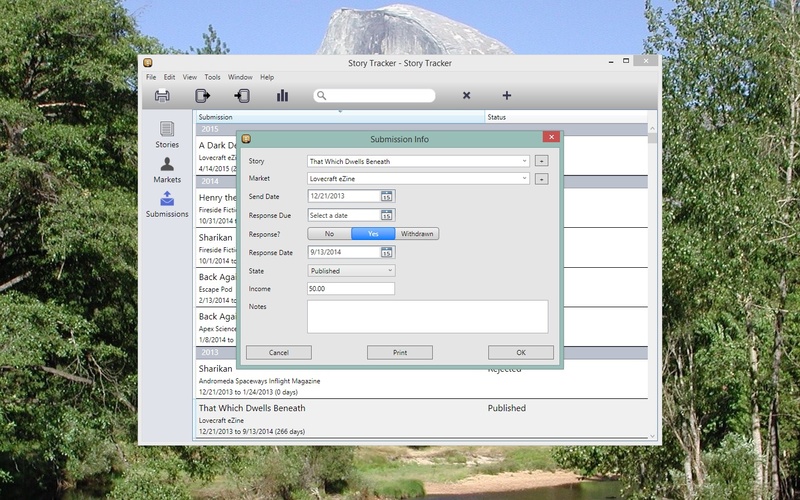 (2) Create a new database within Story Tracker for PC and save it to your Documents folder. (3) Click the Import Database button in the document window toolbar within Story Tracker for PC. This is the button next to the printer button. The button has an arrow pointing to the right, away from the device icon. You can also select the Import from -> Story Tracker Mobile App item in the File menu. (4) The Import Database window will appear. You should see your device shown in the Devices section. If it isn’t there, double-check that you’ve selected Backup Database (or Export Database) on the Tools screen within Story Tracker on your device. Check the Messages box in Story Tracker for PC for helpful information. (5) Select the device you want to import from, then select Restore Complete Database in the Import Options section. You may also choose to Import Stories and Markets, Import Stories, or Import Markets. (7) An alert will appear indicating whether the import was successful. Click Ok.
(8) The database in Story Tracker for PC should now match the database on your device. Note that the above steps will completely replace the contents of the Story Tracker database within Story Tracker for PC, unless you’ve chosen not to restore the complete database. In that case, you may see duplicate entries in your database after the import is complete. 6. I have a Story Tracker database in Story Tracker for PC I’d like to transfer to Story Tracker on my iPhone, iPad, or iPod touch. How do I accomplish this? 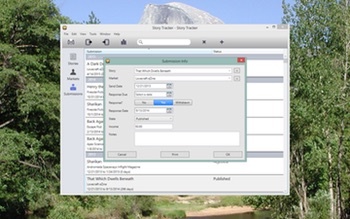 The steps are similar to question 5 above, except you must select either Restore Database or Import Database on your device, and click the Export Database button in the document window toolbar within Story Tracker for PC. This is the toolbar button with the arrow pointing toward the device icon. When the export is complete, you should consult the pop-up alert on your device for further instructions. 7. I have an iPad, an iPhone, and a PC. How do I keep the databases in sync between all of these devices? Story Tracker currently doesn’t have a simple means of keeping databases synchronized on separate devices. However, it is still possible to transfer the database between devices manually. You first need to backup the database from the device with the most current copy to your computer (or from your computer to the device). The steps for achieving this are shown above in questions 5 and 6. A good workflow is to use your PC as a hub for the database, updating that after you’ve made changes on your device. 8. I have the Story Tracker trial version and just bought the full version. How do I transfer my data from the trial version? 9. I have a whole spreadsheet of submission data I’d like to import into the app. How can I do that? Provided your spreadsheet program can export to CSV format and allows you to specify comma separators and dates in a particular format, you should be able to import it into the app. Story Tracker expects to receive CSV data according to the CSV template file, available in the Downloads section of the site. This template file can also be found via the File -> Import from -> CSV menu sequence within the app. 10. Can you incorporate some new fields into the app? Can I change the names of any of the data fields? Incorporating new fields may be possible, but keep in mind that any changes will also need to be made to the iOS app version, where screen real estate is very limited. I’ve tried to select fields that would be useful for most writers using the app, and have tried to minimize clutter as much as possible. The Notes field may be used to log information that isn’t captured by any other field. Sorry, the names of the data fields cannot be changed. 11. What is the X icon in the toolbar used for? The ‘X’ icon (next to the ‘+’ icon in the toolbar) is used to delete a particular story, market, or submission. It has no effect until you select an item from the list. Clicking on one of the rows in the table will select that row and highlight it. To delete the highlighted story, market, or submission, click the X icon in the toolbar. Alternatively you may select Remove Item from the Edit menu. Note that if a particular story or market is associated with any submissions, an alert will appear asking if you still wish to delete the story or market. If there are no associated submissions, the highlighted item will be deleted immediately. 12. What does trunked mean? The Trunked? field appears on the Story Info screen, with options of Yes or No. It essentially means you’ve put the story away in the trunk (or drawer, filing-cabinet, or hard-drive) and don’t plan to submit it anywhere again. You’d typically do this when you’ve exhausted the list of markets you planned to send the story to, or if you don’t think it’s good enough to send anywhere. In practical terms, when Trunked? is set to Yes the story will no longer appear in the drop-down list when you create or modify a submission. You can decide to un-trunk the story at any time by setting the state back to No. 13. I have questions, feature requests, or concerns that aren’t listed above. How can I contact you? You can reach me via email (StoryTracker@andrewnicolle.com), on the Story Tracker Facebook page, or on Twitter (I’m @andrewnicolle). I can usually respond to queries within 24 hours. If you like Story Tracker for PC, please spread the word. Thanks!